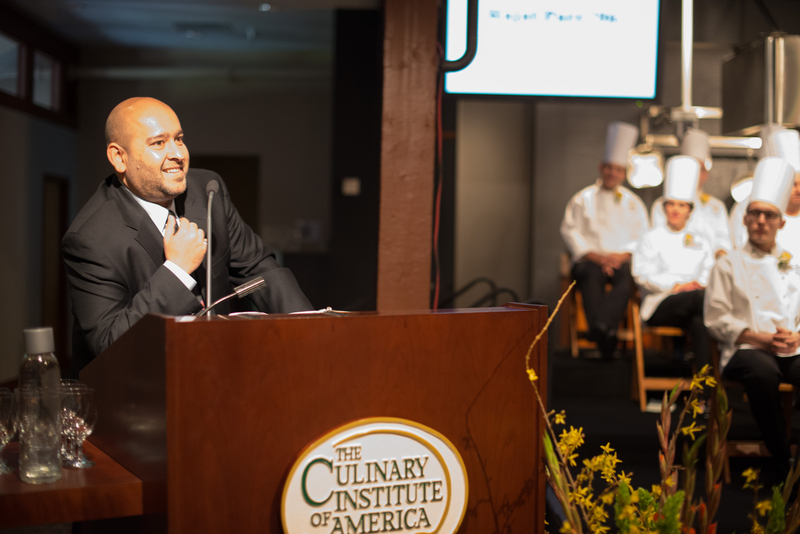 St. Helena, CA – Rajat Parr, a 1996 graduate of The Culinary Institute of America and now a world-renowned sommelier, delivered the commencement address at the college's Napa Valley campus on Friday, March 21. Parr graduated from the CIA intending to be a chef, but discovered wine is his true passion. He encouraged the 31 graduates to also follow their passion and stay inspired, even if a job they've been given is monotonous. "Remember you're going somewhere, so don't stop learning," Parr advised the recipients of associate in occupational studies (AOS) degrees in culinary arts and baking and pastry arts. "Even if it's a mindless job, you have to keep on learning. That's very important." Parr shared a story of working as an intern for a winery and being assigned to box wine bottles. He used the opportunity to post notes with wine terms and study while he worked. Today, Parr owns two California wineries and serves as wine director for Michael Mina Group's 20 restaurants. Parr has earned numerous industry awards, including the James Beard Best New Restaurant Award for RN7; a James Beard Cookbook Award for a book he co-authored, Secrets of the Sommeliers; and a Beard Award nomination for Outstanding Wine & Spirits Professional. He has also been recognized as one of 2009's top sommeliers by Food & Wine magazine, and has won the Wine Spectator Grand Award of Excellence for his wine lists at both Michael Mina restaurant and Fifth Floor.